Last week, I wrote about holidays from your dog's perspective. Frantic activity, changing schedules, trees, candle, bows, parties, music... Yikes! All that happy, but stressful, human chaos can create simmering canine anxieties that result in behavior changes (resurgent chewing, hyper-excitability, over-assertive reactions to visitors). These nuisance behaviors add to human holiday stress, and before you know it, you've got a cycle of anxiety and turmoil that does not improve anyone's holiday cheer level. Now we'll look at another holiday dog issue: The Gift Puppy. Combine over-the-top cuteness with the unstoppable persuasive powers of children, and it's no wonder that puppies top many holiday gift lists. Experts caution against it, but the irresistible allure of a bow-collared puppy romping with over-stimulated, pajama-clad children is just too much: People give puppies for the holidays. But the joy can be short lived. Unlike toys, puppies require long-term attention, care and love. But ask any dog shelter staffer -- the best time to find a pure bred dog is March or April, when the December puppy starts to loose the "cute" factor, and starts acting like an adolescent dog. Often, these dogs begin challenging authority and wreaking havoc in the household because training was overlooked. 1. If you're focused on giving your pet present on a specific day, wait until the excitement has waned to bring him/her into the room. Instruct everyone to put away toys that might otherwise entice or startle him, and urge everyone to stay calm. If more than one person will be vying for face time, work out the plan ahead of time to avoid a meltdown that might frighten your new pet. Plan out your day and the first few weeks ahead of time. My book, Puppy for Dummies, 3rd Edition (Turner Publishing) lays this out nicely. 2. A Puppy is not a stuffed animal. Okay, that's a little obvious, but puppies are more similar to pre-verbal toddlers than to any other pet you'll find in a pet store. Like children, puppies do best with a regular schedule. Stay one step ahead of your pup's basic needs with pre-established feeding times, organized playtime and comforting nap and bedtime rituals. Puppies raised without a set schedule can be fussy, and fussy puppies nip, chew and roughhouse more. 3. Make housetraining priority #1. Whether you chose to use papers or go outside, make potty training your puppy a complete obsession. Wiping up little puppy puddles may seem like no big deal, but understand that your puppy is learning habits that will last a lifetime. Decide on one place for potty training, and take her there after feeding, sleep and playtime. 4. Practice my signature "Loving Touch™" technique. When your puppy is calm, sit on the edge of a chair or couch. Extend your legs to create a cove beneath your legs and say, "under," as you gentle bring your dog into this safe area. Pet your puppy with an open palm in long, soothing, loving stokes. This calming gesture simulates a mother dog's nurturing grooming ritual. You'll use this grounding interaction to calm your dog throughout his life. 5. Leash train your puppy. A very young puppy will stay near his family, but will gain confidence with each passing day. It won't take long before your wallflower is darting off to wander and explore. A leash will ensure her safety. A young puppy happily accepts new experiences, so begin leash training between eight to ten weeks. I hope many of you will weigh in with well-considered thoughts on the subject of gifting pets. I look forward to reading and responding to each one. Some people are animately against doing it, while others can't resist the lure. I dedicate this piece to that audience. Everyone who gets a puppy -- regardless of the month, wants to succeed. I do hope these tips provide a helpful formula. 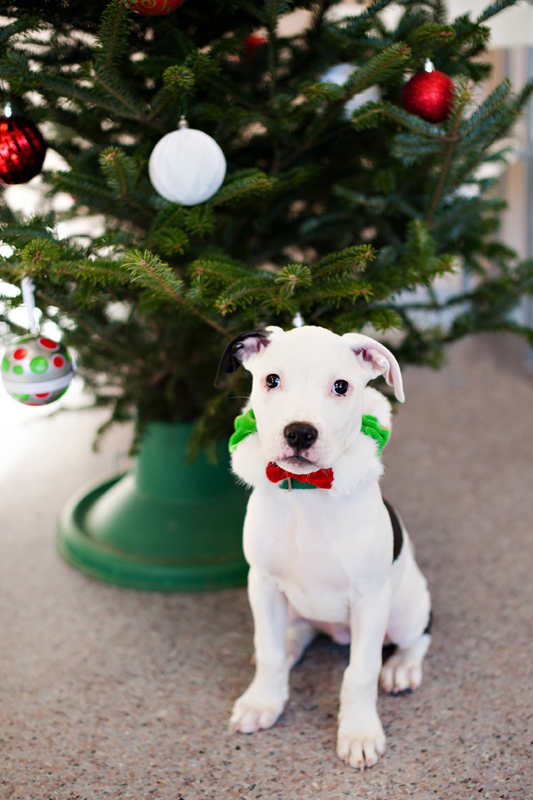 Happy holidays, and happy tails to all!